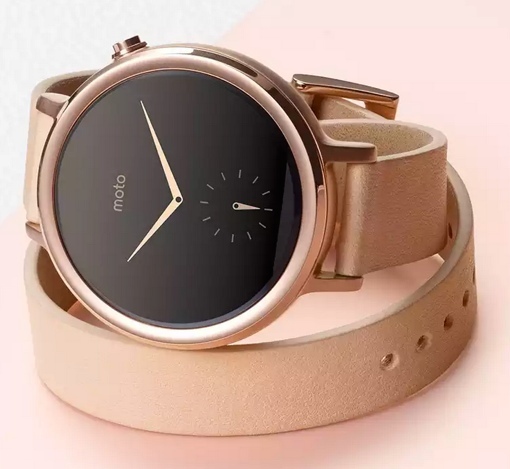 Yesterday, Motorola officially unveiled the second-generation model of its Moto 360 smartwatch. Rather than sticking with a one-size-fits-all design, the Moto 360 is now being offered as a collection – there are now two different mens’ sizes, a woman’s size and sport version with built-in GPS and a more readable screen. Like with the first generation Moto 360 smartwatch, Motorola lets you customize your device via Motomaker. You get to choose your bezel color and style, the color of the watch body and your watchband. Women, meanwhile, have their own unique set of watch style choices, including a rose gold finish and double wrap leather bands. And once you get the Moto 360, you can choose a new Live Dial watch face to complete the look whenever the mood strikes. For sports enthusiasts, there’s a new fitness-minded Moto 360 Sport that doesn’t require a constant phone connection when you’re working out. It has a silicone band (not unlike many fitness trackers) with a special moisture wicking coating and side ventilation channels, built-in GPS tracking and a specially designed display that adapts well to bright conditions. The Motorola Moto 360 smartwatch runs the Android Wear operating system, which provides phone notifications (incoming calls, texts) with voice-powered reply, GPS navigation and access to flight boarding passes. With the right apps and hardware, it can do even more cool things – you can use a Moto 360 to unlock a Kevo, for example. Best of all, this generation of Android Gear now works with both Android smartphones and the Apple iPhone, so you don’t need to worry about compatibility issues. The Moto 360, now with two-day battery life, is currently available through the Google Play store and Motorola.com. It starts at $299.99; price and shipping times vary by style. Expect to pay $429.99 on the upper end – expensive, but still much cheaper than a high-end Apple Watch. For more information, visit the Motorola website or watch the short promotional video below.